Amiga Recovery is a program that can read Amiga Fast Filesystem (AFFS) disk images and recover files off of them. I originally called this program Amiga Explorer but recently changed it because the name conflicted with another project. Next time I'll Google for the name first :). If you need help with this program, find bugs, or find it useful and just want to let me know someone else is using this, feel free to drop me an email (address is listed below). The last feature I plan to add is a mirroring feature so that every file/directory on a partition can be recursively copied to the local disk like with cp -r on Unix. Now you can cd into that volume with a simple cd command: cd hd1: for example. From there you can type dir or ls to get directory listings, cat or type to read the contents of a text file, and get to copy it to your local harddrive. 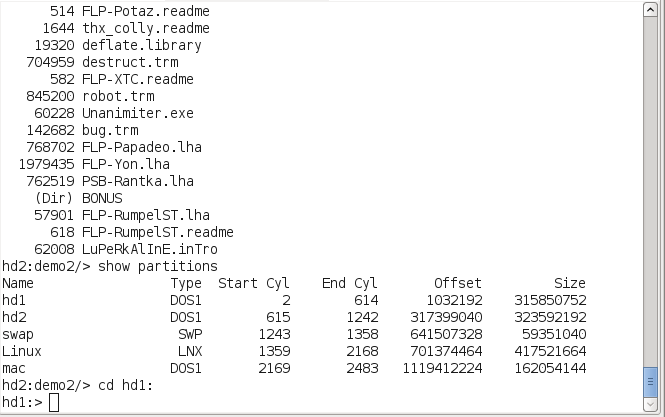 If you think you can mount a single partition you can do: dump partition filename.img to copy it out of the disk image. This program is in BETA condition. I pretty much threw it all together in about a day as quickly as I could so there are a couple quirks in there plus the source code is a little goofy at some points. Use it your own risk.